Winter is one of our favorite seasons in Tahoe South! With so many different activities to do, there is no shortage of fun for everyone in the family. Plus, guests can find the best rates for their travel dates right on our website. Here are some of our top winter activity picks around the area. 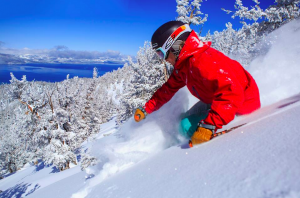 Skiing/Boarding: Of course the number one activity most people think of for winter in Tahoe is skiing and snowboarding! Tahoe South has three main resorts including Sierra-at-Tahoe, Kirkwood, and of course, Heavenly. The Heavenly Gondola is only a short walk away from the hotel, and will whisk you up the mountain, giving you stunning panoramic views of the lake below. We also have Heavenly Sports onsite to handle all of your rental gear needs before hitting the slopes, regardless of which mountain you are set to explore. 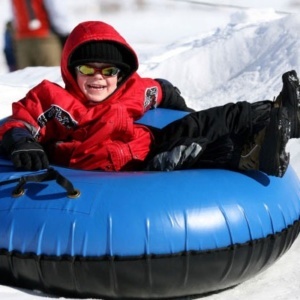 Tubing & Snow Play: This is one adventure everyone in the whole family can enjoy together. Zoom down the snow on a sled or inner tube, or enjoy building a snowman and having a classic snowball fight! Just make sure to pack your sunscreen and bring your camera to capture all of the fun and excitement. Our three top picks of where to go include Heavenly’s Adventure Peak, Adventure Mountain, and Sierra-at-Tahoe. Snowshoeing/Cross-country Skiing: There are plenty of trails to enjoy some snowshoeing or cross-country skiing, whether you are a beginner or a seasoned professional. It can be a great way to explore the peace and quiet of the winter wonderland, away from the hustle and bustle of the resorts. Our favorite spots include Mountain Sports Center at Camp Richardson Resort, The Hope Valley Outdoors Center, and Kirkwood Cross-Country Ski & Snowshoe Center. Each center will have all the gear you need to get started on your adventure along with helpful tips on which trails to explore. What activities do you enjoy in the winter in Tahoe? Share with us on social media using the #MyTahoe. Don’t forget to like us on Facebook, join the conversation on Twitter, start planning your vacation on Pinterest, or follow along and share your photos with us on Instagram to stay connected!